Innovative smartphone app melds print guidebook accuracy with turn-by-turn GPS navigation to accurately locate climbing routes. SEATTLE, Wash. (April 2, 2013) – The crux of a lot of rock climbs may not necessarily be the technical crux. It may be getting yourself to the base of the intended route in the first place. To address that problem, as well as provide an easy-to-use, accurate rock-climbing guidebook solution for the digital age, the climbing guidebook app rakkup is being released this week, coinciding with the annual Red Rock Rendezvous climbing festival. The Red Rocks Climbing guidebook will be the first guidebook available in the free app, made possible through a partnership with the print guidebook publisher SuperTopo. 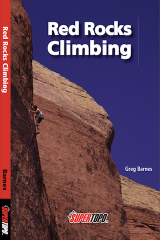 Other guidebooks for additional climbing areas will follow. rakkup uses turn-by-turn GPS navigation, using the GPS capabilities of smartphones combined with digital mapping of the trail systems at climbing areas, to offer users real-time information on the best route to their selected climb. Moreover, once users get close to an intended climbing route, rakkup offers its unique ‘BelayView’ photograph of the climb, so climbers can precisely locate the start of the proper route. 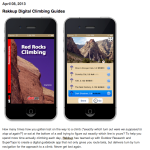 The app downloads guidebooks, photos, and trail maps so that climbers can navigate and view the guide even when out of cell phone range. Rather than simply translating a print guidebook into a digital version for on-screen display, rakkup’s developers worked to develop a mobile app format that allows users to browse climbs via an interactive trail map or convenient lists based on different criteria, and interact with the guidebook in an intuitive touch-based interface so that it’s easy to access detailed information incredibly quickly. It’s truly a guidebook for the smartphone era. The rakkup app is free, and consumers will be able to purchase guidebooks for different climbing areas, based on the print guidebooks created for those places, The digital guidebooks – which will include topo drawings, route strategy, history, climbing beta and rack beta – will typically cost less than their print counterparts, because of the reduction in cost associated with digital distribution. For instance, the Red Rocks Climbs print guidebook sells for $24.99, but is initially available in digital rakkup format for $9.99 for a 12-month license. Both rakkup and SuperTopo have agreed to donate proceeds from all sales of the digital guidebook during the Red Rock Rendezvous to the Access Fund. rakkup was developed by Rob Price and Todd Kutzke, both climbers and former Microsoft employees with a collective 25 years of experience in software development. Price also used 10 years of experience in developing GPS navigation tools for aviation situations to help create the navigation capabilities in rakkup. rakkup and Outdoor Research will support the release of the app at the Red Rocks Rendezvous by holding a scavenger hunt that attendees can complete by using the navigation tools that rakkup offers. People can tackle the scavenger hunt any time during the Rendezvous by stopping by the Outdoor Research booth for instructions. The fastest time will win a climbing-focused apparel and accessory kit from OR. Attendees at Red Rocks who are interested in more information on rakkup can also stop by the Outdoor Research booth. The rakkup app is currently available via Apple’s App Store. For more information on rakkup, visit rakkup.com. Outdoor Geeks brings technology to your outdoor recreation experience to help you maximize fun and minimize epics. Inspired by long days at Red Rocks, Nevada, and in Yosemite Valley, which were made longer by the lack of better information resources, its founders decided to apply their extensive knowledge of software and navigation technologies to the climbing world. Our mission with rakkup is to grow and sustain the marketplace for professionally produced climbing guides by providing tools to the experts who’ve dedicated thousands of hours to assembling the finest information climbers could want. With rakkup, we open a door for authors and publishers to easily produce, market, sell, and distribute professionally-produced guidebooks and compete in a digital world based on the quality of their climbing knowledge, without having to become programmers or undertake costly software development. Founded in 2011, Outdoor Geeks is based in Seattle, Wash.